Mazak “18” 18” x 56” Geared Head Gap Bed Lathe s/n 7754 w/ 25-1500 RPM, Inch/mm Threading, Tailstock, Steady Rest, Tool Post, 12” 3-Jaw Chuck. Sharp First mdl. LC-1 ½ VH Vertical Mill s/n 72072692 w/ 60-4200 Dial ChangeRPM, Power Feed, 9” x 42” Table. Bridgeport Vertical Mill s/n 134468 w/ Anilam Wizard DRO, 80-2720 RPM, 8-Speeds, Chrome Ways, 9” x 42” Table. Norton 6” x 18” Automatic Surface Grinder s/n H493 w/ Magnetic Chuck. Cuttermaster HDT-30 Tool and Cutter Grinder s/n 2046B w/ 5C Air Fixture, 5C Indexing Fixture, Diamond Grinding Wheel, Cabinet Base. Sterling Large Diameter Drill Sharpener. (2) Darex Precision Drill Sharpeners. (2) Pedestal Carbide Tool Grinders. Wilton 4” Pedestal Belt Sander. (2) 6” Belt / 12” Disc Sanders. Sunnen MBB-1290D Honing Machine s/n 14813 w/ Honing Mandrels and Truing Sleeves. Grob 4V-36 36” Vertical Band Saw s/n 1215 w/ 24” x 28” Table. KR Wilson mdl. 37 25 Ton Hydraulic H-Frame Press s/n 2925-A. Miller CP-300 CP-DC Arc Welding Power Source s/n JA383236 w/ Miller Spoolmatic I Spool Gun and Controller. CK Systematics FMP225 Arc Welding Power Source. Ingersoll Rand mdl. 7100E15-VP 15Hp Horizontal Air Compressor s/n CBV324355 w/ 2-Stage Pump, 80 Gallon Tank. Atlas Copco mdl. FX4 Refrigerated Air Dryer. 2002 Dodge RAM 3500 9&#39; Stake Bed Truck lisc# B74951Z (WA) w/ V8 Magnum Gas Engine, Automatic Trans, AC, AM/FM/Cass, VIN# 3B6MD36562M288656. Yale 50VX mdl. GLP050VXEVSE084 4800 Lb Cap LPG Forklift s/n B875B116631F w/ 3-Stage Mast, 189” Lift Height, Side Shift, Solid Tires, 10,238 Metered Hours. Okuma &amp; Howa “Millac 630H” 2-Pallet CNC Horizontal Machining Center s/n 8001 w/ Fanuc Series 16-M Controls, 80-Station ATC, CAT-50 Taper Spindle, 60-10,000 RPM, Hand Wheel, 4 th Axis Thru Pallets, (2) 24 ¾” x 24 ¾” Pallets with Tombstones, Travels “X”=40.16”, “Y”=32.28”, “Z”=32.28”, High Flow Coolant and Filtration System, Turbo Chip Conveyor. Matsuura MC-1000VS2 4-Avis CNC Vertical Machining Center s/n 84043805 w/ Yasnac M5X Controls, 20-Station ATC, BT-40 Taper Spindle, 5000 RPM, 4 th Axis 12” Rotary Head with 8” 3-Jaw Chuck, 19 ½” x 47” Table, Coolant. Kuraki KV1600 CNC Vertical Machining Center s/n 11259 w/ Fanuc System 11M Controls, 24-Station ATC, BT-50 Taper Spindle, 3000 RPM, Hand Wheel, 27 ½” x 80” Table, Coolant. Hitachi Seiki VM-40 CNC Vertical Machining Center s/n 40217SC w/ Seicos CNC Controls, 20-Station ATC, CAT-40 Taper Spindle, Hand Wheel, 5000 RPM, 16” x 30” Table, Coolant. Dynamic – Kosaka 14” Floor Model Optical Comparator. FIE mdl. R Rockwell Hardness Tester. Mitutoyo 40” Digital Height Gage. Fowler Trimos 24” Digital Height Gage. Sunnen PG-800- E Precision Bore Gage and PG-400- E Setting Fixture. (7) Sunnen Dial Bore Gages to 6” and CF-502 Setting Gage. (11) Mitutoyo Dial Bore Gages to 4”. Federal Dimensionair Air Bore Gage. (2) Mitutoyo 6”-12” OD Mic Sets. Fowler 0-6” Digital OD Mic. Mitutoyo Thread Pitch Mics to 4”. (2) 6” x 12” Compound Sine Tables. Thread Plug and Ring Gages. Gage Block Sets and Pin Gage Sets. DEA CMM Machine s/n 671 (NO COMPUTER). 48” x 72” x 10” 2-Ledge Granite Surface Plate w/ Roller Stand. 24” x 36” x 5” Granite Surface Plate w/ Cabinet Base. 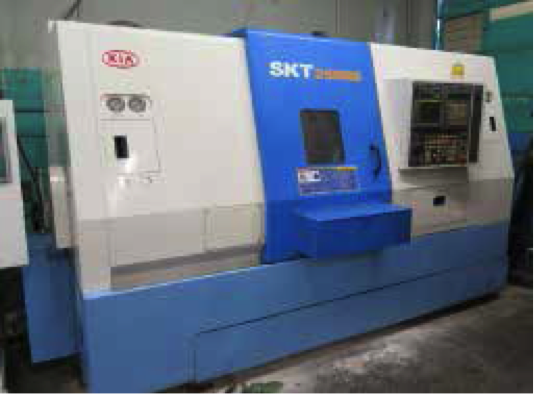 2005 KIA SKT250MS Twin Spindle Live Turret CNC Turning Center s/n SKT250MS-0029 w/ Fanuc Series 18i-TB Controls, Tool Presetter, 12-Station Live Turret, Live Turret Tooling, Front and Rear Rigid Tool Holders, 3500 Main Spindle RPM, 4000 Sub Spindle RPM, 1000 Live Tooling RPM, 10” 3-Jaw Power Chuck – Main Spindle, 8” 3-Jaw Power Chuck – Sub Spindle, 3J Collet Nose – Main Spindle, “C”-Axis @ 0.001 Deg., “A”-Axis @ 0.001 Deg., 16.1” Max Turning Dia., 27.6” Max Turning Length, Parts Catcher, Turbo Chip Conveyor, Coolant, CNC Enhancements “Autobar 400” Automatic Bar Loader / Feeder s/n 182. Miyano ATS-60S Twin Spindle CNC Turning Center s/n ATS0037SA w/ Fanuc 0T Controls, 12-Station ATC, Front and Rear Rigid Tool Holders, 15-3000 Main Spindle RPM, 45-4500 Sub Spindle RPM, 100-3000 Revolving Tooling RPM, 10” 3-Jaw Power Chuck – Main Spindle, S26 Collet Pad Nose Main Spindle, S20 Collet Pad Nose – Sub Spindle, Simultaneous 2-Axis Interpolation, “C” Axis @ 0.001 Deg., 25 ½” Max Swing Over Bed, 28.25 Max Turning Length, Parts Catcher and Conveyor, Chip Conveyor, Coolant, CNC Enhancements “Autobar 400” Automatic Bar Loader / Feeder s/n 491. Hyundai – KIA SKT-25 CNC Turning Center s/n SKT25-0202 w/ Fanuc Series 0i-TC Controls, Tool Presetter, 12-Station Turret, Hydraulic Tailstock, 12” 3-Jaw Power Chuck, 3J Collet Nose, Turbo Chip Conveyor, Coolant. Okuma &amp; Howa 2SP-V55 Twin Spindle CNC Vertical Turning Center s/n 55095 (8011) w/ Fanuc Series 18-T Controls, (2) 12-Station Turrets, (2) 15” 3-Jaw Chucks, 20-2000 RPM, 21.7” Max Turning Dia., Auto Doors, Dual Chip Conveyors, Coolant.